I submitted a query about a product over the long Australia Day weekend and received my reply before 9am the day after Australia Day. You guys must have busted yourselves to answer all the queries posted over the long weekend so promptly. Then, on that Tuesday morning I ordered two cables which arrived in my mailbox in regional Qld the next day. I AM IMPRESSED! Great service, fine product exactly as described and at excellent prices, and speedy delivery -- who could ask for more? Heavy Duty 730mm Black Bookshelf Speaker Stands (Set of 2) + FREE SHIPPING! Got big speakers? …We’ve got big stands. Funky and functional these heavy duty speaker stands are just what your speakers are singing out for! Whilst these speaker stands look sleek and stylish with their simple and modern design, don’t let them fool you, they are also very practical and can actually improve the responsiveness of your speakers. Who would have thought?! The heavy nature of the stands along with the included sound spikes (not suitable for easily damaged flooring surfaces such as wood) help isolate the speaker allowing it to produce superior results. The 2x heavy duty tempered glass plates are connected by a matching gloss black extruded aluminium tube which neatly conseals your wiring. These 730MM Heavy Duty Black Bookshelf Speaker Stands certainly provide solid and stable accommodation for your speakers. 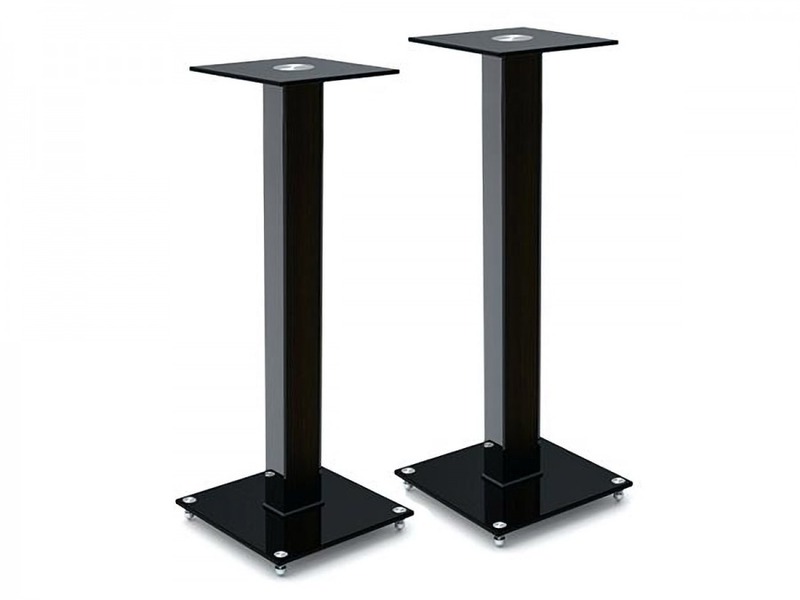 Backed with an exclusive Cable Chick 5 year warranty, the 730MM Heavy Duty Black Bookshelf Speaker Stands are sure to stand up to the needs of speakers. SHIPPING NOTE: Due to the size of these Speaker Stands Express Delivery may not be available to some locations, however quick delivery will still be provided via Fastway Couriers or Registered Post. Cable Chick Tip: From a seated position, tweeters should be positioned at ear level for best sound results. Answer: "These Speaker Stands weigh about 8.5kg each." I purchased these speaker stands from you... quite a while ago. could you advise how much lead shot you would put in the tubes and where can I get it from? Answer: "The weight filler you use doesn't have to be lead shot specifically. Any heavy material you can source cheaply (for example at at a hardware store) will be fine, including thing like ball bearings or fishing sinkers, etc. The quantity you need to use depends on two factors; the weight of the speakers and any future need to move the stands around (making them too heavy to move could be problematic). Generally you'll only need 3 to 5 kilos of weight added per stand to ensure a solid base for most bookshelf speakers. And there's no harm in underestimating the amount - you can always add more later." Thanks very much for your fantastic website! My order was delivered very quickly and without hassle. It was exactly what I was after, and just as the website described it. I'll be placing more orders with Cable Chick very soon!